Magnificent temple Holy Trinity Cathedral of Tbilisi - the main cathedral of the Georgian Orthodox Church, at this time it is here is the chair of the Catholicos of Georgia. This new temple, its construction was started in 1995 by donations from local residents and wealthy patrons. 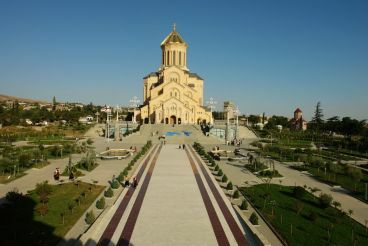 The first service was held on 25 December 2002, and the consecration took place in 2004 - the day of St. George, which made the Catholicos Patriarch Ilia II. 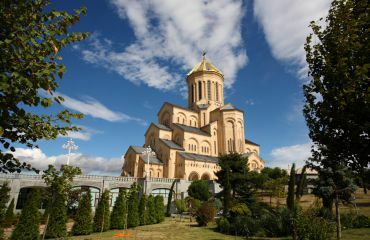 Cathedral is located in the center of Tbilisi , on the hill of St. Elijah, so it can be seen from anywhere in the city. 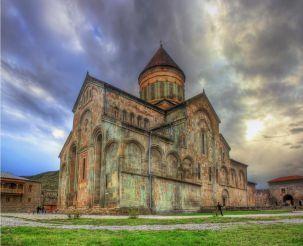 It is the largest temple of Georgia - the height of the building is 101 meters and the total area is about 5000 square meters, which allows you to accommodate 15,000 worshipers. 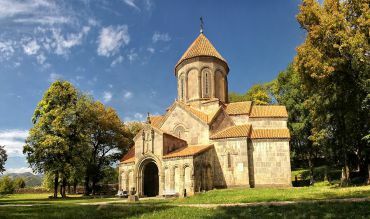 Holy Trinity Cathedral of Tbilisi complex occupies an area of ​​11 hectares of land and includes other buildings - the residence of the Patriarch, the bell tower, the monastery, theological seminaries and academies, as well as nine hours, five of which are located underground at a depth of 13 meters. The interior of the main temple is striking in its monumentality and rich decor, lots of icons, some of them very valuable. Near the altar is a large Bible written by hand. In the temple, excellent acoustics - Georgian male choir singing mesmerizing. 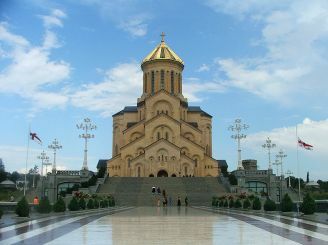 Temple of Holy Trinity Cathedral of Tbilisi in a short period of existence has become very popular among visitors and residents. Incredibly beautiful cathedral at night, lighting emphasizes the beauty and grandeur of the main temple of Georgia.